Two Bears Farm and the Three Cubs: Happy St. Patrick's Day! Adorable!!... and Happy wear'n o the green to ya. I love their shirt! Happy St. Pat's! I love the word Hooligans... it always makes me laugh. Happy St. Pat's Day!! Awww, they are just adorable- love their little green caps! 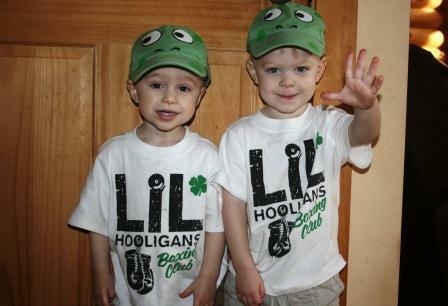 You've got some cute lil' Hooligans over there! Happy St. Patrick's Day! Happy St. Paddy's Day to them too! Happy St. Patrick's Day Lisa! Oh my gosh!! I have been so busy that I forgot about St Paddys day. Thank you so much for reminding me. The kids look so cute in your picture.. Happy St. Paddy's Day to you all! Mint cookies sound so good! Cute li'l guys! I hope they get their green cookies! Livie and I may share a Shamrock Shake after dinner (it's hot enough out, here in corn country for a cool dessert). Awww, I haven't seen such cute leprechauns since my granddaughter gave up Irish dance in favor of competitive soccer. They're darling! Two cuties! Happy St. Pat's Day to you! Happy St. patricks day to you Lisa . Tell the boys they look great!! Love the shirts and hats! I like the idea of the mint cookies too! Such adorable little ones deserve cookies! ooohhh goodness they get cuter with every new picture you post. Awwww! I wish I could give them each a big hug! Love the shirts, too! Adorable and sweet boys you have! My husband's birthday is on St. Patrick's Day so we always celebrate. Oh how cute... Love those shirts and hats... Those boys are adorable!!!!! Hope you all had a great St. Patrick's Day.